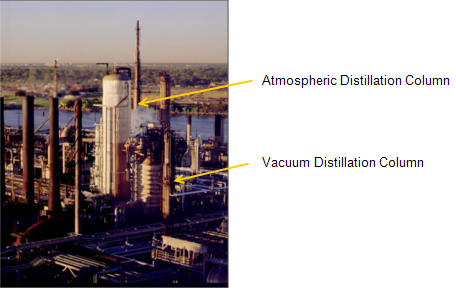 About 80% of the refineries operating in the United States have a vacuum distillation unit (VDU), a secondary processing unit consisting of vacuum distillation columns. Vacuum distillation is a part of the refining process that helps to produce petroleum products out of the heavier oils left over from atmospheric distillation. In the refining process, the atmospheric distillation unit (ADU) separates the lighter hydrocarbons from the heavier oils based on boiling point. The ADU is capable of boiling crude oil fractions to temperatures of 750oF. Above this temperature, the oil will thermally crack, or break apart, which impedes the distillation process. As lighter products are boiled off, the heavier oils, called bottoms, remain at the bottom of the ADU. To increase the production of high-value petroleum products, these bottoms are run through a vacuum distillation column to further refine them. 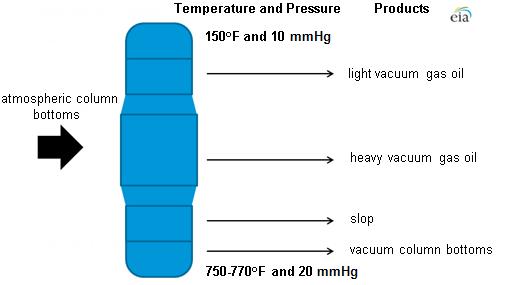 As the name vacuum distillation implies, the distillation column is under a vacuum, or significantly less than atmospheric pressure of 760 millimeters of mercury (mmHg). At low pressures, the boiling point of the ADU bottoms is low enough that lighter products can vaporize without cracking, or degrading, the oil. Source: U.S. Energy Information Administration, modified from Colorado School of Mines. Vacuum distillation produces several types of gas oil. These are slightly heavier than middle distillates such as jet fuel, kerosene, and diesel. In the next stage of refining, these gas oils are further refined to make products such as light-cycle oil (a type of distillate), gasoline, and naphtha. One such refining process is fluid catalytic cracking, which will be the topic of the next refining article in Today in Energy.